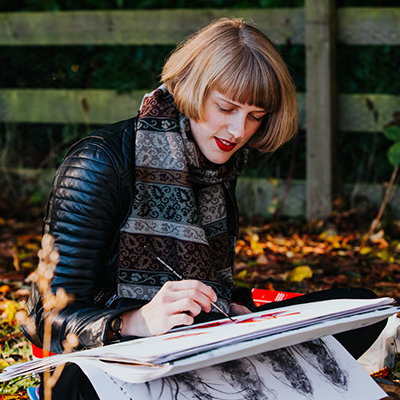 Emma Britton is a decorative glass designer, who launched her own brand in 2010. She is the specialist for beautiful and functional designer-made decorative glass splashbacks, that bring a unique edge to any interior. Complemented by a range of contemporary glassware designs, Emma now has four glass splashback collections and a growing range of homeware. Emma’s designs can be found in kitchens and bathrooms nationwide and her popular glassware and homeware is found in independent stockists. Emma regularly creates site-specific designs for clients both private and commercial. Projects include splashbacks for Telephonica’s London HQ, twenty eco starter homes and homeware designs for the charity Breast Cancer Care. When did you start working closely with florals and plant imagery? My final collection at university was inspired by British suburban gardens, it was then that I realised I had a talent for florals. I don’t think I’d drawn a flower before that point but I was so inspired by the happy accidental colour palettes and the natural forms that I have now built a business around popular British garden florals. You are from Derbyshire, which is where Weleda is based. Do you think this influences your work at all? I find my inspiration in everyday life, walking around seeing a colour palette or an arrangement of branches against a bright sky or cast on a moonlit pavement. I find inspiration in many locations and take snaps of those moments for drawing later. My studio window view is quite leafy, I think the calm helps me to focus. I also enjoy site-specific projects like the Weleda gardens and taking all my inspiration from one place, choosing the best bits to make designs. It creates a very cohesive collection, which I think shows in the results for this project. Are there any particular inspirations that crop up in your designs from time to time? Apart from nature, my work sub-consciously has a retro feel. I think this is because I like 20th Century suburbia and this is evident in my homeware collections, particularly the trays and coloured glassware. I am fascinated by the way people decorate and how through design you can be sensitive to the history of a house, yet create something modern to live with. Design is a constant evolution, sometimes we retain things of value, at other times we re-organise our living spaces to suit our needs. How would you describe your style? Your designs perfectly capture the informality and relaxed atmosphere of Weleda’s organic gardens but they are delicate rather than rustic - is this typical Emma Britton style? My signature style is contemporary with a retro-aesthetic. Over the years of painting my work has evolved and my style has become finer. These florals are typical of my handwriting. Yes they are delicate and there are two reasons for this, mostly because I am responding to what I experienced at Weleda’s gardens, everything is drawn from observation. 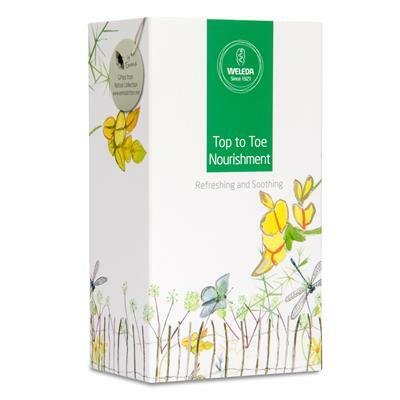 The Summer Meadow Design, which features on the 12 Days of Christmas Calendar and the Organic Soaps, includes delicate wild flowers and therefore requires a finer brush to capture all the detail. The meadow flowers work in harmony with each other, there is no particular flower vying for attention and because I paint with a live palette I often use a fine paint brush and just start painting with little or no pencil. I was very conscious throughout the process that I was designing for packaging, which is a small scale product, therefore a dominating flower would be too much for a little box unlike a five metre glass splashback, which can take a much bigger scale. How did the collaboration with Weleda come about? Weleda’s Managing Director Jayn Sterland saw me exhibiting my work at the RHS Chatsworth Flower Show and saw something in it she liked and knew would be a good fit for the brand. Co-incidentally my studio is down the road from Weleda’s HQ and gardens. 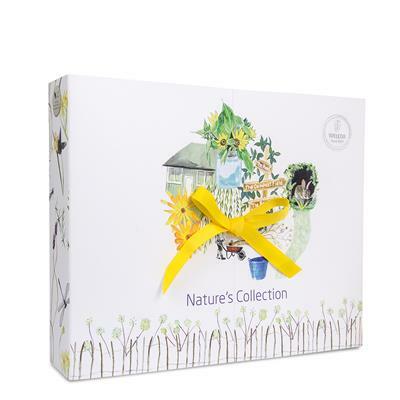 What was the inspiration and process for your designs that resulted in the Weleda ‘Gifted From Nature Collection’? I approached the Weleda project organically and I didn’t put any pressure on myself to achieve a certain aesthetic or design. I relished in the opportunity to spend two weeks at The Field, drawing in meadows, on paths, drinking tea, chatting with the gardeners, always with my paints and my sketchbook. I did lots of paintings and took photographs, then I took them away to the studio and evaluated them and worked them up into designs. All the repeats are created by hand. It felt very luxurious to have the time to do this. Everything you see on these packs is drawn from observation and seen by me. It is a very true collection, which I hope captures the spirit of The Field, a magical place. Do you have any particular favourite medium to work with when you sketch? Gouache! I sketch a rough outline and then paint the detail with a live palette (mixing directly on the page). I like gouache because it moves on the page so you can build it up. It’s flat and it doesn’t have much texture, which means the vibrancy in my work is from the pigments in gouache. Are you prolific in your designs or very focused? It depends - there is a time to be loose and a time to be refined. As a designer I am a very focused but when I sit down to draw it just comes to me (most of the time)! What would you say are your particular strengths or what are you building your reputation around? My strengths are designing repeated natural patterns and I have built a reputation in the interiors industry on my style of floral print. I do have a distinctive style and it’s becoming recognised, which is amazing, this is why I was a good fit for Weleda. 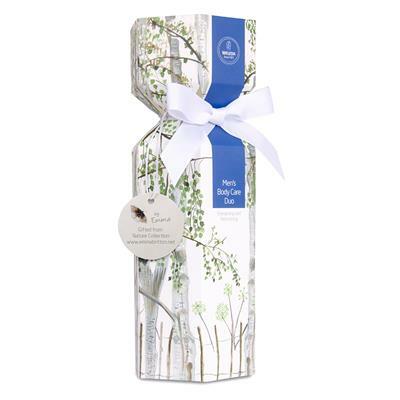 Do you have a favourite Weleda Christmas gift from the new Emma Britton Gifted By Nature collection and why? Ooh that’s a hard question! I love the Men’s Body Care Duo with the silver birch trees, but my favourite is the Gardener’s Favourites. 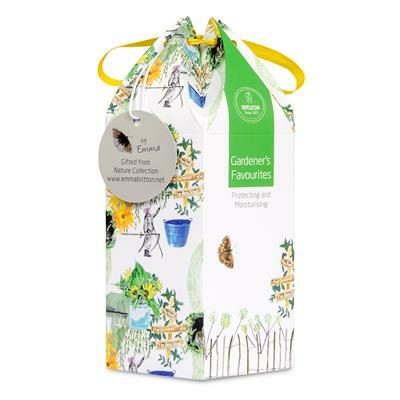 The pack designers have done an amazing job with the shape of the box and my Gardener’s repeat looks fabulous on it. This Christmas I will definitely be giving it to the gardeners in my life. This design captures the important work the Weleda Gardeners do - it features them at work, the winding paths that are synonymous with The Field, the rabbits they fence out of The Compound, the trugs they use for harvesting, the flowers on their table at tea break. Do botanical ingredients matter to you when it comes to choosing your skincare? Absolutely, I have sensitive skin and I do not want anything toxic in my beauty regime. I am increasingly aware of what is flushing into our water systems and making efforts personally to live a greener life such as reducing my single use plastic consumption and buying greener cleaning products. That’s why designing for Weleda has been such a privilege. What are your personal favourites from the Weleda range and why? Pine Bath Milk, it smells incredible and is really calming. I think the Arnica Massage Balm is really effective and highly recommend it. One of the best things about this opportunity - a dream project - is learning more about Weleda’s authentic range which is truly amazing. Oh, and Skin Food moisturiser of course, it goes without saying!